I went with my mother to see Julie & Julia in theaters. I remember it being predominately women in the theater (and their captive husbands, of course). I also remember that I left the theater wanting good cheese, something rather difficult to procure at big box stores. Since then, I've watched the movie a couple of times and read the book. Meryl Streep does a fantastic and almost creepy job of capturing Julia Child. Her storyline shows a beautiful marriage that is funny and moving. Julia triumphs again and again in her pursuit of the career she wanted despite the best efforts of the male dominated Cordon Bleu. The costumes and pacing is really well done as well. However, the more times I watch the movie, I feel that Julie comes off as a neurotic, self-absorbed and generally clingy. 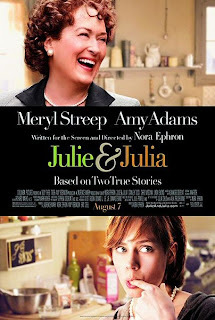 Amy Adams does a pretty good job acting, but the movie takes a sort of weirdly anti-feminist turn in her story line: her office job offers no satisfaction, so she turns to cooking and her domestic idol of Julia Child, thus becoming too wigged out to be a good partner for her husband. Um. Is this movie really saying domestication is the path too happiness and that women will never quite swing both a job and domestic bliss? Because that's the feeling I'm getting. The book does a much better job of explaining Julie's frustration, but at the same time, the book is scattered. I didn't have a sense of time passing and her relationship with Julia Child, her friends, and her husband seemed to have little to do with finding peace while cooking. I really think she could have figured out what exactly she was writing about: her marriage, getting older and being dissatisfied, the pure love of food? As is, its a simple record of a year of time without much focus. Basically, I recommend renting the movie with a plate of pasta nearby and skip the book.